One of the major 21st century challenges for politicians and polities at both the national, regional and international levels is the governance of ever-more global, mobile and flexible economic and financial flows. No more so than in the area of taxation, which looks likely to remain the last bastion of entrenched perceptions of national sovereignty, an undisputed cornerstone of the independent and authoritative government, the undeniable prerogative of national policy-makers in the face of growing global economic integration. Or perhaps world leaders are slowly warming to the fact that they need international co-operation, if they want to address tax competition and the pilloried global tax system in any meaningful way? 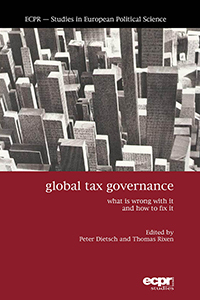 Peter Dietsch and Thomas Rixen’s recent edited volume on Global Tax Governance (sub-titled “What is wrong with it and how to fix it” – straight to the point) certainly seeks to leave you with the feeling that it is both desirable and irrefutable, “an idea whose time has come”, with reform proposals waiting for the Obamas and Merkels of this world to wake up and smell the coffee. Global Tax Governance comprises fifteen chapters from a very strong line-up of contributors across the disciplinary divides, compiled by Dietsch and Rixen into 350-or-so pages of excellent reading. International tax competition and co-operation are not simple issues; they are multifaceted, difficult, wicked phenomena, so the diversity of inputs is both welcome and necessary. The chapter authors include economists, legal scholars, political scientists, and political philosophers. This provides a well-rounded gathering of perspectives, which covers many of the key stories of both the problems and solutions related to global tax governance. But there is no denying that this is first and foremost a political economy book – the pure economic and pure legal perspectives, for instance, are marginal. Still, for anyone looking for an intermediate dive into tax competition and the state and issues of international tax governance, this is, to my mind, the top place to start today. Compared to other recent books on global tax issues, this one scores as the least morality-born but most refined in terms of its problem-identification and solution-building. While Thomas Pogge and Krishen Mehta’s Global Tax Fairness covers more ground and is provocative in its content at times, Global Tax Governance is a more academic book (incidentally because they are more academic authors), with a greater focus on succinct analysis and structure, and probably greater overall coherence. And compared to Dietsch’s previous Catching Capital, as a compilation it is much more diverse and yet more detailed, though the reading flow is obviously worsened by its amalgamative nature. Dietsch and Rixen have both written extensively on the topic before, and the book emanates with their footprints. Dietsch’s work on political philosophy and economic governance, which has often touched upon taxation, provides the backdrop to many of the normative and ethical arguments throughout the book, while Rixen’s research on the nature of tax competition and the international tax system as well as his proposed institutional framework solution (an International Tax Organisation) feature especially in the opening and closings of the volume. Moreover, the flavour of Dietsch and Rixen’s close associates (including Philipp Genschel and Laura Seelkopf) shine through. A quarter of the book chapters are written by this group, and several more are based on or build directly on their work. Which is okay (it is their book after all), though you might get the feeling that this analysis and solutions are the only game in town (and of course they won’t tell you otherwise). The purpose of the book is to identify the need for global tax governance (i.e. the cause problem), take stock of the current international institutional make-up and its shortcomings, set out the normative foundations for a new direction, and propose specific political solutions. The book is divided into four parts to reflect these purposes. In Part One, we’re treated with two superb walkthroughs by top tax economist Kimberly Clausing and Genschel/Seelkopf on the economic and political nature of tax competition and its impacts. Tax competition is damaging on national coffers and on the economy, we’re told in resounding detail. And it is widely harmful, except for capital and everyone in small open democracies, of course. But it’s a negative-sum game, so in the end the world is worse off. So why haven’t we fixed it? The “winner group” – small economies and capital owners – have powerful voices. And that voice includes the argument that every country has the sovereign right to set their tax rates as they see fit – a significant argument in a world apparently stuck in 1648 Westphalia. And besides, as Lyne Latulippe argues in chapter three, national policy-makers tend to internalise the idea (with a nudge or two from the “winner group”) that they must keep their tax offerings competitive, just like a firm’s market offering must be competitive, no matter that it is probably an awful and damaging analogy. Latulippe’s argument that national tax policy discussions are soaked with competitiveness discourse is something I have also shown for the international level in the OECD/G2o BEPS project. So where we have gone wrong? In a lot of places, Part Two tells us. Enforcement of international tax governance is a mess (Richard Woodward, chapter five); it will only succeed when, once in a blue moon, the US gets its act together (Lukas Hakelberg, six and Itai Grinberg, seven); and even current international tax reforms are unlikely to succeed (Richard Eccleston and Helen Smith, eight). Woodward emphasises the national implementation dimension of international tax governance, arguing that tax havens do “mock compliance” to OECD’s tax information exchange standards, feigning alignment while muddling enforcement behind their backs. As we’re also seeing in the current BEPS project and elsewhere, the national take-up of global tax standards is highly varied, so this is an interesting point to follow – and Richard has promised more work on this topic, which is absolutely welcomed. Aside from technical and political shortcomings, Dietsch (in particular) and Rixen often emphasise the normative underpinnings of international tax governance. It’s not enough to say the system doesn’t work, we need to say, ethically, why it must work differently. Thus, Part Three takes us through the ethical case for global tax governance. Miriam Ronzoni (chapter nine) weighs global justice arguments in political philosophy, sketching out why and how either of various positions should address tax competition. And Laurens van Apeldoorn (10) discusses in detail different notions of sovereignty and how they relate to the argument for tax governance. While work by both Rixen and Dietsch (see my book review) have contended that national sovereignty isn’t harmed by tax competition, Apeldoorn mounts the stronger claim that tax competition outright harms national sovereignty, discussing sovereignty recast as a responsibility (rather than a right), requiring not merely non-interference in extraterritorial affairs but a positive obligation to support sovereignty and democracy abroad. Dietsch’s chapter (11) is essentially a shortened version of part I of his previous book, though without a discussion of implementation through an International Tax Organisation (you’ll see why shortly). The book testifies to that fact that national sovereignty seems to have emerged as the favourite argument against tax competition/for tax governance among the Dietsch/Rixen et al. group (even if they discuss different types of sovereignty and related arguments). The sovereignty-focus has been picked up from earlier work on tax havens, such as that by Alan Hudson and Ronen Palan, but it aligns rather poorly with the political discourse of today. The book does tune into, occasionally, the popular stories of tax competition’s effect on inequality or the national coffers of developing countries, financial system risk or human rights, but those are peripheral to the sovereignty argument. I did say this book is less morality-borne than others, but in arguing their cause, it is strange to see so many well-known and well-founded arguments lay idle. Having thoroughly assessed the issue and outlined the burning platform, Part Four finally gives us the solutions. To be honest, my hopes weren’t high for the final chapters, as I feared they would merely re-state old proposals. And indeed, the chapters pick up on existing reform ideas – unitary taxation and formulary apportionment (Reuven Avi-Yonah, chapter 13), financial transactions tax (Gabriel Wollner, 14), and an International Tax Organisation (Rixen, 15) – while not considering other fundamental questions of the international tax system (e.g. source v. residence). But still, I was to be pleasantly surprised. The chapters do a very good job of not only explaining the proposals in the context of the book, often the authors provide specific links back to the first three parts of the book, explaining to the reader why a given solution addresses current shortcomings identified in Part Two, or why they would fulfill the normative cases of Part Three. Reuven Avi-Yonah, who has published an infinite (it seems like) number of pieces on unitary taxation proposes, as we would expect, to heal the broken global tax system through unitary taxation with formulary apportionment (UT+FA). However, here Avi-Yonah is more compromise-seeking than elsewhere, where he has mostly proposed UT+FA as a “system overhaul”. His short ‘sweeping away’ of UT+FA criticism leaves something to be desired, but he puts forth the applicability of the UT+FA solution to the current issues (including as identified throughout the book) with usual pomp. Rather than promoting a full UT+FA installment, he proposes here a compromise with the prevailing arm’s length standard (ALS), using the UT+FA method selectively (within the confines of the current ALS system, notably), in situations where transfer pricing requires profit split attribution, and he discusses the need for further reconciliation between the two approaches. Rixen himself rounds it all off, detailing the institutional solution to others’ material policy proposals. And of course, it is the International Tax Organisation (ITO), untouched by Dietsch in chapter 11 but brought back to the surface here. Rixen’s ITO is a WTO-style arbitration/enforcement solution with a forum-capacity, just as described by Dietsch in his recent book (who has the idea, I believe, from Rixen in the first place). The novelty for regular Dietsch/Rixen readers is modest, but he does engage in a much more detailed explanation of the proposed institutional design, which may serve as a blueprint for policy-makers. Still, while Part Four contains good chapters, it remains a compilation of various proposals with Rixen’s institutional shell, and not really a coherent solution on how to “fix” global tax governance, as the book’s sub-title promises. All in all, though, this is a fine body of work, recommendable and readworthy. It provides the fundamentals of tax competition, the burning platform, and a number of well-known policy proposals, all nicely wrapped in a book that explains well what it wants and where it is going. It can be read as a whole or as individual chapters, each of stands on their own as contributions to the literature. There are some odd chapters here and there, and there is a definitive bias in favour of certain argument (e.g. sovereignty), which leaves some interesting points and explorations on the table. But those are minor appeals in the grander scheme. The authors have told us why tax competition is damaging, why international tax cooperation is needed, and the direction of travel for policy-makers. Now, I think the authors would agree, it is up to policy-makers, academic colleagues and other interested parties to take up and discuss their ideas more widely. Considering that this new book is a descriptive work about different kinds of taxation and their implications on the social system, I find it surprising that nothing has been mentioned about the most socially just form of taxation, that of Land Value Tax or LVT. LVT was proposed by Henry George in 1879 in his seminal book “Progress and Poverty”. I am concerned that this method of taxation has not apparently come to your attention and that the various advantages and disadvantages of it have not been included in this new book. Perhaps you and your experts should seriously consider the various aspects of LVT . Below please find my essay about the LVT–the most socially just kind of tax.